The Shutter Station is a family run Scottish company based in Glasgow. We measure, supply and fit custom made internal wooden window shutters for our customers in Glasgow and surroundings areas, although we are happy to cover other areas. * Custom made quality window shutters to your exact requirements. * Professionally measured and fitted. * Choose design and colours in your own home. * Excellent & Friendly customer service. If you would like to find out more about window shutters: from how they work to how they would be designed to suit your windows or doors, and also find how much they would cost you, we offer a free home visit that will cover all these topics and more. No pushy salesman. The Shutter Station both supplies and fits your new window shutters and only use qualified time served joiners for all of our installations. In addition, our Window Shutters, sometimes referred to as "Shutter Blinds", are both a superior and child-safe alternative to window blinds with no cords. Also view our Contacts page for some more information on our window shutters. Then take a look through our Gallery to see photographs of a variety of window shutters available. 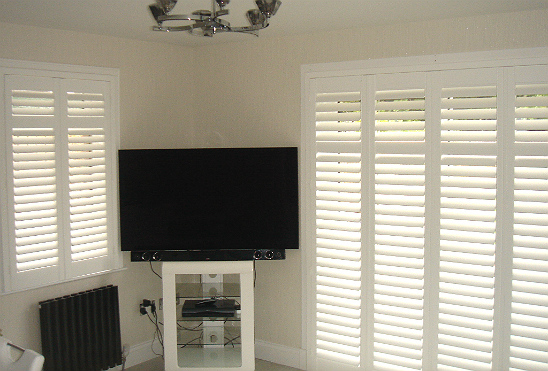 Please note all shutters would be made exactly to your specific requirements. If you have had any dealings with The Shutter Station, we would be delighted to receive your feedback. Whether you have just had a quote, have had shutters fitted by us or even just been browsing through our website, please feel free to e mail us your thoughts on the e mail address provided above. Thanks for taking the time to do this, it is much appreciated. All window shutters in our galleries are recent clients of the Shutter Station.